"Just remember, he is as old as a Whipid Sorcerer's farts, so remember to speak loudly, if he trails off or starts rumbling, just be patient, and whatever you do, don't mind the smell around him, alright?" RANK: Baron of the Protectorate, Second Lieutenant, Commander of the Second "Iron" Company and Extermination Squad, First Battalion of Omega Pyre, Observer of Abregado-Rae, Head of the Iron Chef's Fine Steaks and Rations Company, Abregado-Rae Guild of Hammers, and Abregado-Rae Holo-Vision Network. SKIN: At first rust colored with spots of different colored metal patches being used, plenty of burn and scorch marks, his original polish is long gone, now giving him a dull and ragged look. Recently he was repainted into steel-gray color with red details, mark of Omega Pyre painted on one side of his chest, the Skull of Mandalorians on the other. Extraordinary Physique- Increased Strength and Speed: As a machine, HK is much more stronger, agile, and flexible than a human being, often utilizing his customized state-of-the-art body in order to overwhelm his opponents with pure brute strength or speed. This can also be seen in his brutal and effective fighting style, often utilizing his body for acrobatics or powerful unexpected attacks. Manumission and Self-Evolution- Programming Complexity: As a reward for his service for the Jedi, HK was given manumission, that means his programming was purged from all restricting protocols, giving free will to his artificial intelligence. This manumission, among with centuries without mind-wipe, allowed his programming to self-evolve, becoming much more organic and "quirky" in nature. As a result, HK can act very much like a human can, showing understanding and ability to wield emotions and feelings. This also resulted in HK's programming being one of a kind, with little to no viruses being effective against him, and hacking attempts being extremely difficult. Metal Body- Damage Reduction: Due to the fact that his body is made of metal rather than organic substance, HK is much more resistant to slugthrowers and physical attacks, he is also able to survive in the vacuum of space and does not perceive pain. 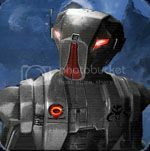 Photographic Memory- Identification: HK, as a droid, is capable of photographic memory, taking in all the little details and able to recount specific events with great care. Swift Eyes and Sharp Mind- Spotting and Tracking: Thanks to his photoreceptors, motion trackers, and sensors, HK can keep up observing even the fastest of opponents, watching the battlefield in what can be considered slowed tempo. He often pairs this with his processor, able to calculate and plan at high-speed rate, projecting paths of his enemy's weapon and projectiles in order to dodge them, block them, or deflect them back at his attacker. Assassination Protocols- Stealth and Sniper Rifle Proficiency: Due to the Assassination Protocols HK was manufactured with, he has always been proficient with sniper rifles and usage of stealth equipment and tactics for his advantage, ranging from setting up ambushes to sniping or quietly knocking his target out. Bladedancer- Unique Melee Light Armor Combat Style: As a Bladedancer, HK's fighting style relies on a whirlwind of high speed precise attacks and dodging the enemy's attacks, going around them rather than confronting them. As such, HK is a very agile, hard to hit opponent who would try to outmaneuver his enemy rather than simply defeat them head-on. Gunslinger- Pistol Proficiency: HK is highly proficient with pistols, often choosing them as his preferred ranged weapon, utilizing them with his sensors, he can deliver rapid bursts of deadly accurate shots. Iron Knight- Unique Melee and Ranged Weaponry Heavy Armor Combat Style: As opposed to the Bladedancer style, HK formed the Iron Knight techniques to be used during full on battles rather than smaller duels or skirmishes. It is a tactic used mostly against a group of opponents with a force of allies, all clad in medium or heavy armor. It is a direct and brutal but efficient combat style utilizing benefits of heavy armor to close the distance quickly while providing suppressive fire from gun emplacements and laying defensive support for any force following the front line. Jedi Lightsaber Trainer- Lightsaber Proficiency: Due to his past as a Lightsaber Training Droid, HK picked up a lot of knowledge about the art, able to recreate many techniques and moves to the point of master-level combat. HK then took that knowledge further, shaping the forms he learned into his own combat technique. In the end, his past as a training droid allowed him to become a skilled duelist as well as a wise teacher. Kinetic Movement- Trained Ability to Notice Body Movement: A skill taught to HK by Kira Liadain to HK in Working Out the Old Kinks it is based on HK using his high speed trackers and sensors to detect body movements in order to gain a better understanding on how his enemy will attack or dodge, the goal of this was to give the droid a slight edge by teaching him to anticipate enemy movements split second away. Martial Arts- Hand to Hand Combat Proficiency: Receiving a martial training long ago during the Old Republic, his fighting style is a mix of Echani and Mandalorian martial arts, blended together and polished into a new custom form over the years of his travels. First Baron Observer- Reputation and Presence in the Omega Protectorate Territory: By now HK has built up a reputation for himself around the Omega Protectorate, especially among the common folk and soldiers. It began with the word about him spreading through the Pyre forces as the droid was given nickname "The Siege Tower of the Pyre" due to his efforts in minimizing casualties on the field by protecting the soldiers on the front lines with his own body and saber. His reputation spread then to civilians as his deeds of saving prisoners and innocent caught in crossfire were publicized during his service at the side of Colonel Kerrigan, often resulting in the droid being unnecessarily injured. The latest event in increase of his reputation among the Protectorate was the droid receiving title of the First Baron and a rank of Observer, placing the planet of Abregado-Rae under his management. HK made sure that the event was shown to public through Protectorate holo-news and ever since then appeared regularly for media, whether it was in combat saving more civillians, or otherwise, to maintain his reputation. I've Seen it All- Lore: Due to his long lifespan, HK has seen the Galaxy since the Old Republic, witnessing many major events, and even sometimes taking part in them. As such, HK has large quantities of knowledge regarding Galactic history, its cultures, and many of its languages, both dead and contemporary, due to the mix of his experience and the protocol components he was given during Old Republic. Being a droid only helped to maintain and take in all of the information he accumulated. Like A Fungus- Long-Term Charisma: Although most people start out having mixed feelings towards the ex-assassin droid he does have the uncanny ability to grow on them. Most of the beings he meets end up in circles of his friends, for example the members of the Protectorate as well as some of the Jedi. However, it is something that happens over time and prolonged interactions, at first the droid has charisma of a toaster. No Disassemble- Vulnerability to Electricity: Like every droid, HK is vulnerable to electric and ionic attacks, however, he is aware of that and found many ways to protect himself against it. Over 20,000 Retconned Midi-Chloroxians- Force Absence: As a droid, HK is absent from the Force, it is very difficult to track him using it, however, he is unable to use it or sense it. Diet of Oil and Wookiee-ookiees- Heavy: Due to the weight of the metal body and armor he often wears, HK can be at a disadvantage in softer terrains, such as swamps or bogs. Quirky Programming- Programming Complexity: Due to the unique nature of HK's programming, it takes longer time to provide repairs to it and its copies can be considered valuable. Child Crying- Martyr Complex: HK would be unable to stand by while the innocent are being harmed, always willing to rush to help when sorrow and harm strikes the innocent civilians, especially when it puts the droids in a way of unnecessary harm. This can be a weakness used to lure him into a trap by threatening or harming the innocent. Glory to the Hunter- Seeking Challenges: HK loves hunting and challenges, often collecting trophies, this tendency can often get him in trouble, causing him to facing challenging foes, sometimes without backup, and it could just as easily be used by his enemies to lure him into a trap. Hatred Towards the Sith- Negative Bonus Towards Relations With Members of the Sith Order: HK has strong hatred towards the Sith, he will be often willing to volunteer in attacks against them, hunt them for sport, or interrogate them in order to attempt at breaking them or collecting trophies from them. Safe to say, this comes with a degree of prejudice and lack of diplomatic skills when Sith are involved. Mistrust Towards the Jedi- Prejudice Towards Members of the Jedi Order: Due to the droid's past with the Jedi and Republic, where he was betrayed by the Jedi soon after trying to protect their temple, HK mistrusts Jedi, sworn to never again join their ranks or serve the Republic, however, he is willing to work with them on occasion.